SOME TIME AGO, in a blog post I read (origin long forgotten), the author provided an alarming account of a speculative concern that Guiness Stout may no longer be offered in the US; lack of consumption being the root cause. I immediately rushed to the liquor store and picked up several cases. I have not been able to substantiate the opinion, nor have I been able to stop buying Guiness, but the thought that such a wonderful product might be disappearing from the shelves still makes me break out in a cold sweat. It would be most difficult to sort through Friday afternoon happy hour without my beloved Black and Tan. As consumers, we have a responsibility to spread the word in praise of misunderstood products. The motives are self-serving but also prevent the demise of cool stuff across the spectrum. From time to time, it seems companies invent something that’s so cutting edge, so unique, or so outside conventional thinking, that it never takes hold. I mean, look what happened to the DeLorean, right? How cool was that thing? In the category of fishing stuff I can’t live without, Rio Products’ Extreme Tippet is a versatile piece of gear that’s never absent from my fishing vest. It’s a non-negotiable! This product is so wildly misunderstood and underutilized that I fear it may be dropped from their product offering altogether. Recognizing this, I’ve bulked up on a supply that I hope will get me through the rest of my fishing life. It’s a synthetic braided material, so I have high hopes for a long shelf life. Dyneema, the chief ingredient in Extreme Tippet, is braided together with hundreds of fibers, making it incredibly strong when compared to copolymer or fluorocarbon materials. Its reduced diameter in contrast to conventional tippet makes this stuff perfect for fast-sink applications such as Czech Nymphing or short-line nymphing. With all the attention being paid to Czech-style fishing these days, I’m baffled by the fact that anglers wouldn’t glom onto the principle terminal tackle used by the Czech fly fishing team to dominate the World Fly Fishing Championships several years back. Generally speaking, for clear Western tailwater nymphing, I attach a small piece of fluorocarbon to my Extreme Tippet (versus taking it all the way to my first fly) for stealth. This material requires the use of back to back Duncan loops, opposing splices from a Tie Fast Tool, or a quadruple surgeons knot when attaching it to mono or fluorocarbon. The other benefit, and probably the primary one for Extreme Tippet, is that is has zero stretch. This means it is wicked sensitive to bite detection and lightning fast in reaction to hook sets. Similar to braided fishing line, this begs the question, Can all those bass anglers really be wrong? Extreme Tippet provides tremendous benefit to nymphing anglers that require a material that will allow them to pick up the most subtle takes. For those of you who enjoy fishing without indicators, there isn’t a better material available to sort through tricky currents, drop to the bottom, and give you the feel necessary to detect ticks along the streambed. For swinging streamers…. well let me just say, HOLY SHINOLA! Combine it with the use of stinger hooks in your patterns and you just may never miss a short take ever again. This presents limitless possibilities for trout, bass, and of course steelhead. 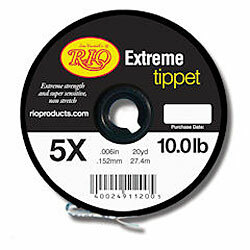 Let me put it this another way: Extreme Tippet with a diameter of 4x has a tensile strength of 15lb test mono, and 3x is 20 lbs! If you want a material that will add life-like presentation to your streamers or steelhead flies, yet will enable you to stay hooked up come game time, Rio Products’ Extreme Tippet is the solution. If you’re a big water large trout angler fishing from a drift boat to the bank—especially when you need to huck huge streamers or large dry flies right to or under overhanging branches, there’s just nothing like this stuff. Its slim diameter lets you impart action in your patterns, yet its strength gives you all the horsepower you need to rip Mr. Brown Trout out from underneath a log jam or gnarled cutbank as you go floating by. Lastly, for bass fishing, Extreme Tippet rocks. Its zero stretch gives you a tremendous upper hand when you’re loading up a BASS Master Classic hook set on a huge bucketmouth, boiling striper or angry smallmouth. I love to use this tippet on a cut-down three-foot section of Rio’s Freshwater VersiLeaders (2.6 ips) combined with shad patterns or Dahlberg Divers. For frog patterns, when I’m casting right up on shore and popping back to the boat, Extreme Tippet gives me the confidence that I can mingle with fallen timber, sunken Christmas trees, boat docks, cattails or any other shallow water nastiness and still get my $7.00 fly back. I hope you’ll give it a try. Again, my recommendation is self-serving as I want the product to stick around, but I’m confident you’ll be happy with the outcome. It’s probably important for me to point out that I have no affiliation with Rio Products nor am I being paid to endorse their product. It’s just really good material. There are a couple of things you want to be aware of: First, regular knots won’t work on Extreme Tippet. You’ll want to use primarily Rapala or loop style knots. Duncan Loops, triple or quadruple surgeon knots also work very well to join this product to other single strand materials. An Albright knot is an excellent solution for joining the tippet material directly to your fly lines, but remember to seat it very slowly, working the line into position with non-overlapping wraps. Two, be careful with this stuff. It’s thin diameter and ultra strength can cut you in an instant when seating knots. Seat slowly and avoid over-wrapping around your hands without a rag handy.